Before the leaves disappear from the trees get out and enjoy a few of the fun seasonal activities fall has to offer! 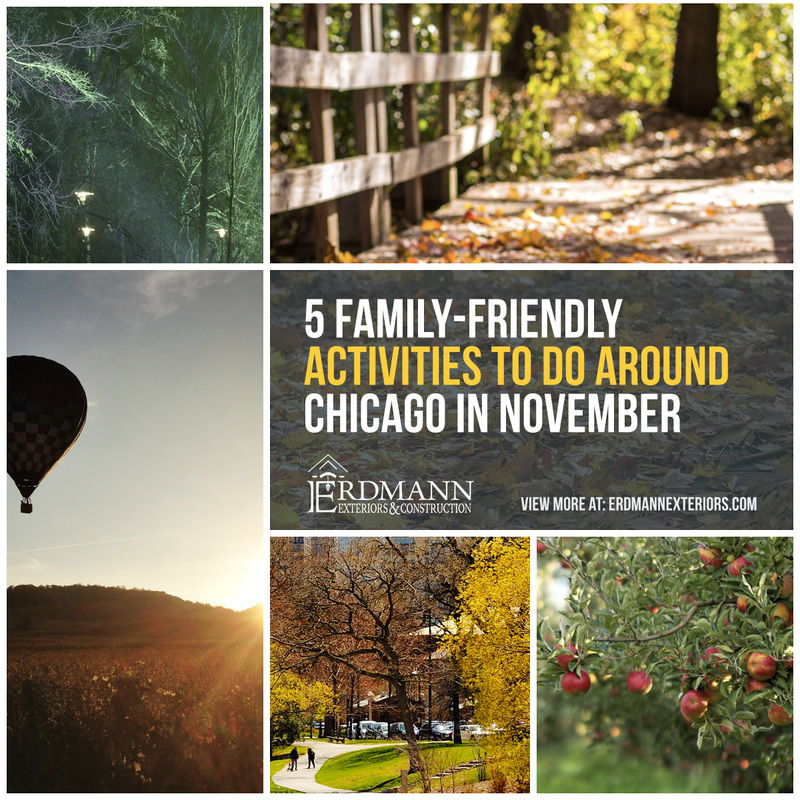 From apple mazes and hikes to hot air balloons and illuminated events, we’ve put together some of our favorite things to do this time of year in the Chicagoland area! Skip the traditional corn maze – an apple maze is much sweeter! Royal Oak Farm Orchard’s apple tree maze, “Amaze ‘N Apples,” is the first apple tree maze in the nation. Stroll through 1.5 miles of trails shaped like a giant apple, created out of living apple trees, and pick two apples along the way. The largest piece of land in the Cook County forest preserve system and bursting with fall colors. Check out the unique observation blind along Long John Slough. The Little Red School House Nature Center is a place to learn more about the gorgeous sights. Includes 1,700 acres and hundreds of thousands of trees from 40 countries! Hike or bike the numerous trails. Or, for those looking to enjoy fall’s colors from the comfort of their vehicle, drive the scenic roads throughout the park. The Arboretum’s award-winning Children’s Garden is a favorite for kids of all ages 😊. With over 18 canyons carved by snow runoff and natural springs, creating a breathtaking landscape. With over 13 miles of well-marked trails, families can explore their own path. Voted #1 attraction in the state of Illinois, Starved Rock is a perfect day trip from the city. Located in nearby Joliet is worth-the-drive! It’s a great place for a leisurely walk along a forested path. With 640 acres of land, picnic grounds and playground areas, you are sure to get your daily steps in, while enjoying the scenery. Enjoy scenic views and an adventure with a balloon ride this fall! Galena On The Fly offers hot air balloon rides from sunrise to sunset. Drift above the rolling landscapes of Jo Daviess county and the Galena countryside while taking in views of Iowa, Illinois and Wisconsin, from 3,000 feet above. Make this a day trip. Plan approximately one hour for the balloon trip, and about 2.5 hours for the whole event. After landing, explore all that Galena has to offer: art galleries, historic sites, and unique shops. Make it a weekend by booking one of the many Bed & Breakfast’s in the area. Light up one of your fall nights with an event that’s taken illumination to the next level. Illumination: Tree Lights at The Morton Arboretum is a feast for the senses. You’ll be surrounded by color as you walk a one-mile paved path amid interactive lighting effects that highlight the beauty of trees in winter. Enjoy seasonal music, marvel at ever-changing, interactive lighting designs, and warm up by a crackling fire. Whet your whistle with a cozy drink or roast marshmallows for every season’s favorite treat: S’mores! Get a jump start on the holiday season and the crowds. Starting November 23, the famous Lincoln Park Zoo flips the switch for ZooLights. This is a family affair, offering over 2 million lights, photos with Santa, a maze of 30,000 lightbulbs, ice carving demos, carousel rides and the Lionel Train Adventure. We hope you and your family get a chance to enjoy all that fall has to offer . . . before the first snowflakes begin to fall!